Illustration of a quantum randum network. Internet, networks of connections between Hollywood actors, etc, are examples of complex networks, whose properties have been intensively studied in recent times. The small-world property (that everyone has a few-step connection to celebrities), for instance, is a prominent result derived in this field. A group of scientists around Professor Cirac, Director at the Max Planck Institute of Quantum Optics (Germany), has now introduced complex networks in the microscopic, so called, quantum regime (Nature Physics, Advanced Online Publication). The scientists have proven that these quantum complex networks have surprising properties: even in a very weakly connected quantum network, performing some measurements and other simple quantum operations allows to generate arbitrary graphs of connections that are otherwise impossible in their classical counterparts. The behaviour of networks has been widely explored in the context of classical statistical mechanics. Periodic networks, by definition, have a regular structure, in which each node is connected to a constant number of ‘geometrical’ neighbours. If one tries to enlarge these systems, their topology is not altered since the unit cell is just repeated ad aeternum. The construction of a random network is completely different: each node has a small probability of being connected to any other node. Depending on the connection probability and in the limit of infinite size, such networks exhibit some typical effects. 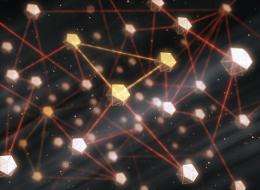 For instance, if this probability is high enough, nearly all nodes will be part of one giant cluster; if it is too small only sparse groups of connected nodes will be present. In a quantum network one link between neighbouring nodes is given by one pair of entangled qubits, for example atoms; in other words, one link in a quantum network represents the entanglement between two qubits. Therefore, a node possesses exactly one qubit for each neighbour, and since it can act on these qubits it is called a ‘station’. This holds for any kind of quantum networks. However, there are different ways of defining the entanglement between neighbouring qubits. Until now, quantum networks have been mostly modelled as periodically structured graphs, that is, lattices. In the work described here the scientists set the amount of entanglement between two nodes to be equal to the connection probability of the classical random graphs. In the classical case, some specific subgraphs appear suddenly if one lets the connection probability scale with the size of the network: for very low probabilities only trivial connections (simple links) are present in the network, whereas for higher probabilities the subgraphs become more and more complex (e.g., triangles, squares, or stars). In quantum networks, on the other hand, a qualitatively different behaviour emerges: even for the lowest non-trivial connection probability, i.e., if the entanglement between the nodes is, at first sight, just sufficient to get simple connections, it is in fact possible to generate communication subgraphs of any complexity. This result mainly relies on the superposition principle and on the ability to coherently manipulate the qubits at the stations. “In our article we want to point out that networks with a disordered structure and not periodic lattices have to be studied in the context of quantum communication”, says Sébastien Perseguers, who has worked on this topic in the frame of his doctoral thesis. “In fact, it is well known that real-world communication networks have a complex topology, and we may predict that this will also be the case for quantum networks. Furthermore, we want to emphasize the fact that the best results are obtained if one ‘thinks quantumly’ not only at the connection scale, but also from a global network perspective. In this respect, it is essential to deepen our knowledge of multipartite entanglement, that is, entanglement shared between more than two particles.” In the future the scientists are going to extend their model to networks of a richer structure, the so-called complex networks which describe a wide variety of systems in nature and society, and they expect to find many new and unexpected phenomena. FYI Image caption "Illustration of a quantum randum network." might want to spell random without the U. Agree. Come on guys, at least read it once before you post it. Nah. They just did it this way because it rhymes better. vowels don't have the same sound in different languages, that's why english doesn't have logical spellings, because we've allowed words from different languages into english without spellings being corrected for vowels spellings and other things. This article was probably translated. Colour = color, etc.